Move over, three fuel assemblies with damaged/deformed fuel rods inside in the Reactor 4 Spent Fuel Pool! You're nothing. According to Kahoku Shinpo, a Fukushima local paper, TEPCO admitted on November 15, 2013 that there are 70 fuel assemblies with damaged fuel rods in the Reactor 1 Spent Fuel Pool, located on the operating floor (top floor) of the reactor building whose air radiation levels are measured in millisievert/hour and sievert/hour (first floor). There are also three such fuel assemblies in the Reactor 2 SFP, and four of them in the Reactor 3 SFP. Total 80 spent fuel assemblies in the SFPs in Reactors 1 - 4 are damaged. The damages had been there long before the March 11, 2011 accident, and TEPCO claims it properly notified the national government as they discovered the damages. But the company has come clean in public only now. Reactor 1 at Fukushima I Nuke Plant is TEPCO's oldest nuclear reactor; it was entirely the project by General Electric of the US, a turnkey. 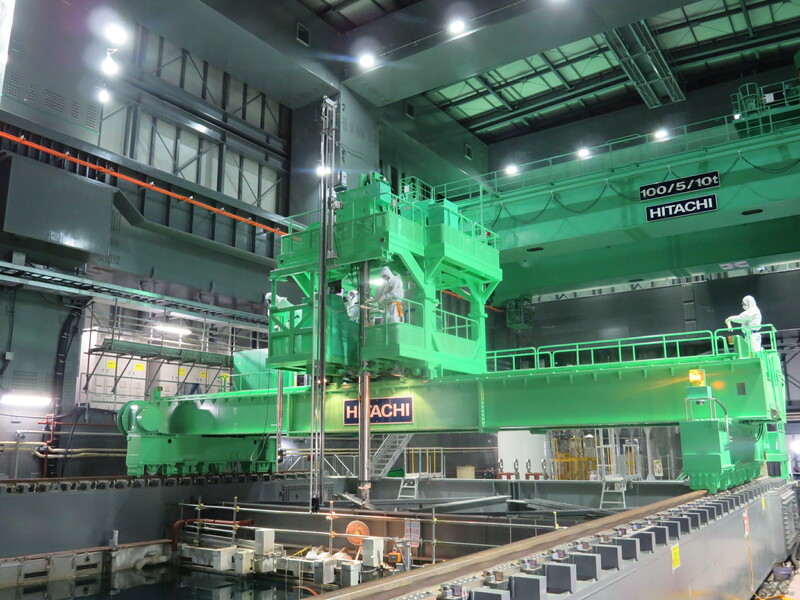 It was revealed on November 15 that 70 fuel assemblies in the Reactor 1 Spent Fuel Pool at Fukushima I Nuclear Power Plant had had damages before the March 11, 2011 earthquake/tsunami. The damaged assemblies are about one-quarter of the 292 spent fuel assemblies stored in the pool. Technologies to remove damaged fuel haven't been established, and there are worries that [the revelation] may negatively affect the plan to remove the fuels from Reactor 1 [SFP] starting 2017 and the decommissioning work in general. TEPCO hadn't disclosed all the facts until November 15. The company says it had reported to the national government as required. According to TEPCO, these 70 fuel assemblies had series of problems including leakage of radioactive materials from small [pinhole-size] holes [on fuel rods]. So the company removed them from the reactor and stored in a separate location inside the Spent Fuel Pool. There are three damaged fuel assemblies inside the Reactor 4 Spent Fuel Pool, where the removal of the fuel assemblies will start on November 18. 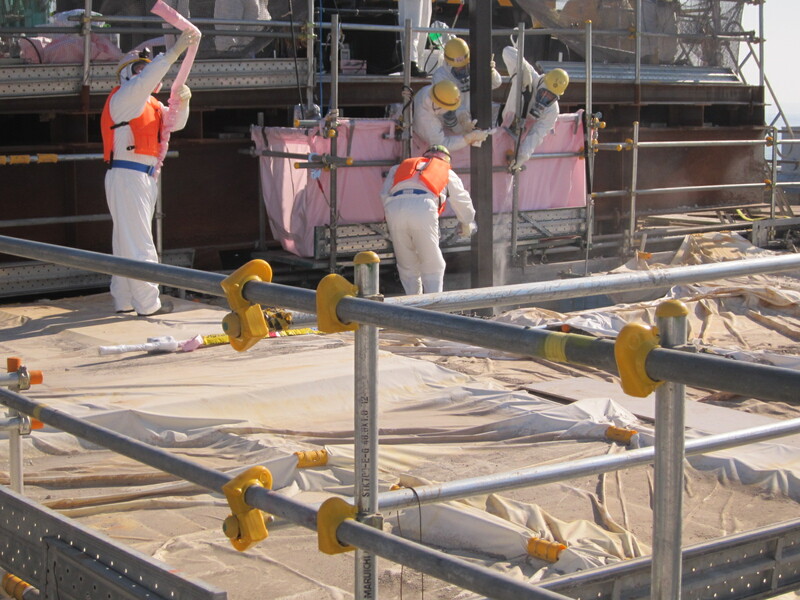 TEPCO has postponed the removal of the damaged assemblies as it is difficult to remove them in a normal manner. Other than in the Spent Fuel Pools of Reactor 1 and Reactor 4, the Reactor 2 Spent Fuel Pool has three damaged fuel assemblies, and the Reactor 3 Spent Fuel Pool has four, making the total of damaged fuel assemblies 80. TEPCO will consider the measures such as building a dedicated container for transfer for these damaged fuels. As to the reason why Reactor 1 has the largest number of damaged fuels, TEPCO says, "Reactor 1 [at Fukushima I Nuke Plant] is the oldest nuclear reactor of our company, and we hear that there were quality control issues when the fuel rods were manufactured and that there were many fuel rods with inferior quality. From Reactor 2 onward, much improvement was done on the fuel rods, and quality improved." Reactor 1 at Fukushima I Nuke Plant is the first nuclear reactor for TEPCO, and it started the commercial operation in March 1971. No major national newspaper has covered this story so far. The small boat that can, fitted with video camera and dosimeter, boldly going where no humans can ever go (ambient air dose of 1.8 SIEVERT/hour max). The boat was lowered from a hole (510mm in diameter) drilled on the floor of the 1st floor of Reactor 1 into the torus room which is flooded with highly contaminated water leaking from the dry well. The boat looks to be tethered, meaning human workers from Hitachi Nuclear Energy were operating it from the 1st floor of the Reactor 1 building which has rather high air dose levels (unlike Reactor 4, the levels in Reactor 1 is in millisievert/hour, with several locations in sievert/hour). There is no information as to the radiation exposure for the workers who operated the boat. Now, we need a little submarine that could to dive under the water in the torus room and check the damage on the Suppression Chamber and the surrounding walls. And a swarm of self-organizing, self-propelled small flying robots for the upper floor surveys, and an army of soldier ant robots to eat away the irradiated concrete debris on the operating floors and inside the Spent Fuel Pools of Reactor 3 and Reactor 4. According to NHK (11/15/2013), TEPCO will start removing the fuel assemblies from the Spent Fuel Pool of Reactor 4 at Fukushima I Nuclear Power Plant on Monday, November 18. TEPCO will start with unused (therefore not irradiated) new fuel assemblies (there are 202 of them in the pool). 22 new fuel assemblies will be the first to be moved UNDER WATER into the container (called "cask") in the cask pit, using the fuel handling machine. Then the sealed cask will be lifted out of the pool by the gantry crane onto the truck waiting on the ground, which will transport the cask to the Common Pool about 100 meters away. TEPCO has two casks to be used for transport. After removing 22 new fuel assemblies, then TEPCO will start removing the spent fuel assemblies. The removal is scheduled to continue until the end of next year, "ahead of schedule" as has been loudly demanded by the LDP politicians. Workers who tweet from Fukushima I Nuke Plant say the people who will be operating the fuel handling machine and the gantry crane are the workers with long experience and expertise in fuel handling, from TEPCO's primary contractors. Not "yakuza and rank amateurs". In the process, a mishap may occur, and the fuel rods may be scattered on the ground, then they go critical. And on and on till the end of either the northern hemisphere or the entire planet. Just like many North American experts, the professor simply declares conditions in the Reactor 4 SFP are "perilous". The common Pool is 100 meters away, not 50 meters. It's not "rods" but "assemblies". No idea what he's talking about when he says "two of the rods touch", but I have seen this phrase in other places from other experts. It must be part of the standard things to say if you are to comment on the fuel "rods" from the SFP at Fukushima I Nuke Plant. That Tokyo is part of "surrounding areas" of the plant would be news to most Japanese. Compared to other reactors that suffered the core melt, the air radiation levels in Reactor 4 have been low enough (measured in microsievert/hour instead of millisievert/hour in other reactors) to allow human workers to work inside the reactor building and on the top floor for the past two and a half years. It must be from the explosion! Or from something TEPCO has done since the accident, whatever it is! If TEPCO is to be believed, TEPCO has been hiding the damages for at least 10 years; the oldest damage was from 25 years ago. According to Yomiuri Shinbun (11/12/2013), that's not clear, and you would be excused if you thought the damages were recent (after March 11, 2011). 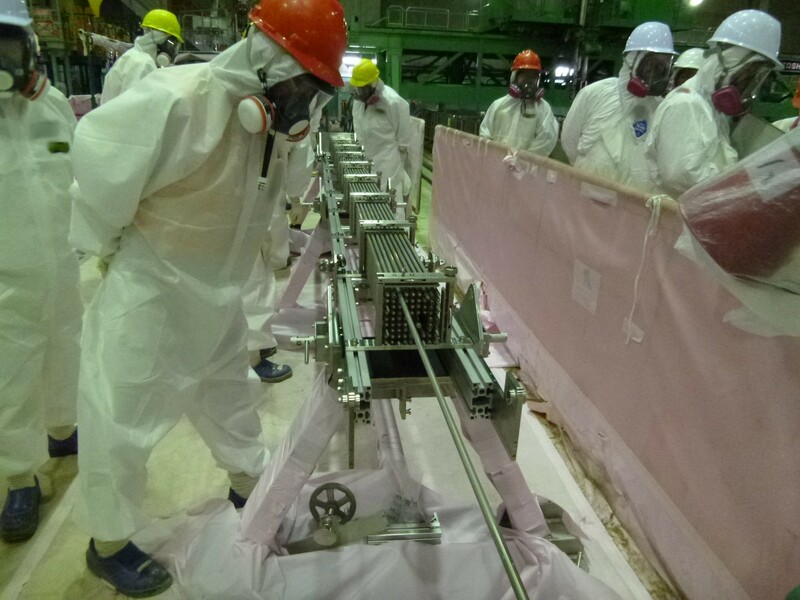 On November 12, TEPCO disclosed that there were three fuel assemblies out of 1533 fuel assemblies in the Spent Fuel Pool of Reactor 4 at Fukushima I Nuclear Power Plant that were deformed and would be difficult to remove. The removal of fuel assemblies from the Reactor 4 SFP will start this month. The three fuel assemblies has slight deformation or damage caused by the past work [in the SFP]. No leak of radioactive materials has been observed. TEPCO will transport other fuel assemblies first, while they figure out how to remove and transport these three fuel assemblies. Nuclear Regulation Authority has already approved the fuel removal, and the work will start within this month as scheduled. So, are these fuel assemblies new? used? How long ago was the "past work"? According to TEPCO, one of the damaged fuel assemblies is bent at a 90-degree angle [literal meaning: bent in the shape of a Japanese character "く"; actual angle could be less]. It was bent 25 years ago when a mistake occurred in handling the fuel. The other two were found to be damaged 10 years ago; there are small holes on the outside from foreign objects. TEPCO is investigating whether the damages to the fuel assemblies were made public when they were discovered. According to Fukushima Minyu, the occasion was a visit by the delegation of the Fukushima Prefectural Council for Decommission Safety Monitoring. The council members include officials from the Fukushima prefectural government, municipalities around Fukushima I Nuclear Power Plant, and experts. How do you bend a fuel assembly at a 90-degree angle, handling it in the spent fuel pool? And how could Yomiuri call a fuel assembly bent at a 90-degree angle "slight deformation"? Slight? For your information, there are 1533 fuel assemblies (each of which contains 50 to 60 fuel rods in channels inside the casing) in the Spent Fuel Pool of Reactor 4 at Fukushima I Nuclear Power Plant. There used to be 1535 fuel assemblies there, but two new fuel assemblies were taken out from the Reactor 4 SFP last year for examination. Of 1533 fuel assemblies currently in the Reactor 4 SFP, 202 of them are never-used, brand-new fuel assemblies. The rest, 1331 are used fuel assemblies. Of 1331, 783 are spent fuel assemblies that have been stored in the SFP at least for several years; 548 are the fuel assemblies that had been used in the Reactor Pressure Vessel until Reactor 4 went into extended maintenance to replace the core shroud. These 548 "hot" fuel assemblies were taken out of the Reactor Pressure Vessel and placed temporarily in the Spent Fuel Pool. A prospective buyer at a dealership in Saitama Prefecture sustained slight neck injuries, while the dealership employee on the passenger's seat broke his arm. A Mazda Motor Corp. (7261) sport-utility vehicle equipped with an automatic-braking system crashed in Japan on Nov. 10 during a dealership test drive, injuring the driver and front-seat passenger, according to the police. The Mazda CX-5 was being driven by a prospective buyer on the dealership’s parking lot when it crashed through a urethane barrier set up to demonstrate the SUV’s automatic braking feature, according to the Saitama Prefectural Police, which is investigating the accident. The customer suffered a neck injury while the dealership employee sitting in the front passenger seat fractured his arm, the police said. The car started from about 7 meters away [from the urethane mat]. After hitting the urethane mat, the car collided with the fence about 6.6 meters away. Needless to say, the car was supposed to detect the mat and stop. Automatic braking and automatic (self) driving are touted as the next huge things for the auto industry. But when more than half of the proceeds of QE to date... have ended up at foreign banks, perhaps at least a theatrical congressional hearing is in order? That has brought to mind an article that I read yesterday in Japan's Nikkei Shinbun, which said part of the quantitative easing by the US Federal Reserve after the so-called "Lehman Shock" in September 2008 was not so much about helping the US domestic banks or the US housing market but about responding to the demand for the US action from foreign governments for their financial institutions, particularly from China and Japan, two largest foreign holders of the US treasuries　AND mortgage-backed securities issued by Fannie Mae and Freddie Mac. In the US, the purchase of mortgage-backed securities (MBS) issued by Fannie and Freddie by Federal Reserve has been explained as measures to support the housing market. It's that way even today. Two months after the "Lehman Shock", the US Federal Reserve decided to purchase long-term bonds issued and guaranteed by the US government corporations [Fannie Mae adn Freddie Mac], as emergency response measures. It was the beginning of the extraordinary monetary easing that still continues today. What forced Chairman Ben Bernanke's hand was the cry for help and the pressure from foreign governments, including Japan and China. November 24, 2008 at night, Federal Reserve Board in Washington DC. "I will announce it tomorrow. Prepare the package for additional measures as soon as possible. One-page summary, and quick." Bernanke instructed the staff with a slight quiver in his voice. Early next morning on November 25, Federal Reserve Board called an emergency meeting and decided on the emergency response measures that centered on the purchase of long-term bonds issued and guaranteed by Fannie Mae [and Freddie Mac]. 8:15AM US Eastern time. The announcement by FRB was typed on one page, in 13 lines. The total amount of purchase by Federal Reserve would, however, be 600 billion dollars. It was the beginning of an extraordinary measures whereby Federal Reserve, central bank of the US, would buy bonds directly from the market. "Our first priority was to assure the market. There was little basis for the amount," says an aide to the chairman at that time. Why did Federal Reserve choose to buy the long-term bonds issued by Fannie and Freddie? The official (ostensible) reason was "to support the housing market which was the cause of the financial crisis". However, there was an "international pledge" [as the real reason] that the US government had made right before the "Lehman Shock". On the night of September 7, 2008. Treasury Secretary Henry Paulson had just announced the effective takeover of Fannie and Freddie, and he was now on the phone. "The US government will now fully back these companies." The Treasury Secretary was talking to the Chinese counterpart. Paulson also conducted a teleconference of G7 finance ministers, and made a pledge that the US government, for the first time, would guarantee the bonds issued by Fannie and Freddie. It was clear that the collapse of the housing bubble left Fannie and Freddie deeply insolvent. In the meantime, the long-term bonds issued by them were estimated at that time to be about 1.5 trillion dollars. These bonds were considered high grade with implicit guarantee of the US government, and held by more than 130 entities such as governments, central banks, and institutional investors in Europe and Asia. The two most worried countries were China and Japan, whose holdings were No.1 and No.2. President Hu Jintao of China pressured the US by threatening to sell its large holding of the bonds even at a loss. At one time, a plan was being discussed whereby the Japanese government would take over (buy) part of the Chinese holding. If China dumped the bonds from Fannie and Freddie the damage to the international financial markets would be immeasurable. It didn't come to pass, but "Japan and the US were seriously considering the plan" (according to the source in international finance). The situation was very tense. Slight quiver in his voice. That's poetic of Nikkei, but I think Mr. Bernanke's speaking voice always sounds like that. By the way, how much Fannie and Freddie papers did China and Japan have at that time? China had over 500 billion dollar worth of mortgage-backed securities from Fannie and Freddie, and Japan had over 250 billion dollars worth. The third largest holder was Russia, at slightly over 50 billion dollars. China and Japan were worried, Nikkei says. China threatened to dump, Japan was willing to buy what China would dump. In 20-20 hindsight, if China had dumped and Japan had picked up those MBS at a significant discount, maybe Japan would have no problem paying for the nuclear accident cleanup. Oh well. Nikkei doesn't say why Federal Reserve was worried enough to start purchasing the MBS from Fannie and Freddie at that time. I don't remember the reason myself. All I remember was that the stocks of investment banks like Goldman Sachs, Citi, JP Morgan Chase were on a free fall in November, and a extra large downward pressure was on the stocks on November 21, 2008 which was Friday. After the announcement by Federal Reserve on November 25 next Tuesday, the stock markets were lifted somewhat, but all it did was to not fall for the duration of the year.